Hello and welcome to the second group post for the July Papertrey Ink Release! The new products you are seeing here will be available in the store at Papertrey Ink on July 15th at 10:00 EST. I'm real excited to share this project with you! It was so much fun to do! I love to scrapbook, but have done it digitally for many many years, so it was kind of fun to actually print out some photos and do some hands on paper scrapping! This is the front cover of my album. I decided to create a little album for our last vacation we took along the eastern part of the United States. I cut my album cover out of Classic Kraft card stock. I cut two and glued those together for extra durability I used the Scene It: Mountain View to create a little backdrop for my title. I also used a strip of the Traveler's Journal paper down the front edge. This is my first spread inside. The left photo is me with my two kiddos. The one on the right is my main squeeze, me, and my favorite little girl. I used some of the stamps from the Traveler's Journal stamp set and some dies from Traveler's Journal Outer Cover. I also used paper from the Traveler's Journal paper pack for both of my pages. The tiny flags are from the Moments Inked Planner Banner dies and I stamped them with the words from Traveler's Journal: Typed Words. 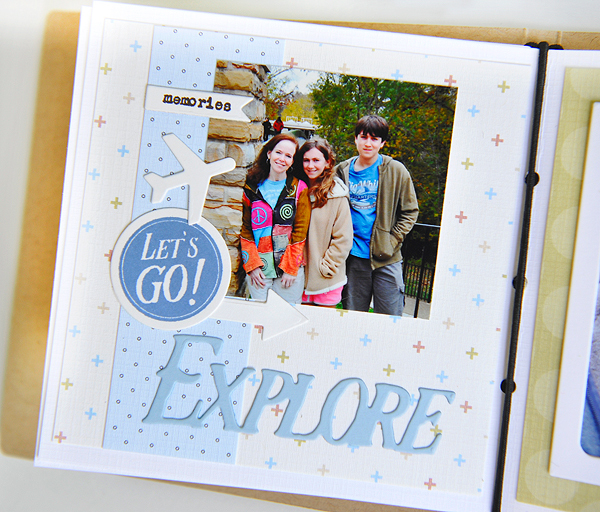 The frame around our photo is included in the dies that come with the Traveler's Journal: Outer Cover. This is my second spread in the album. 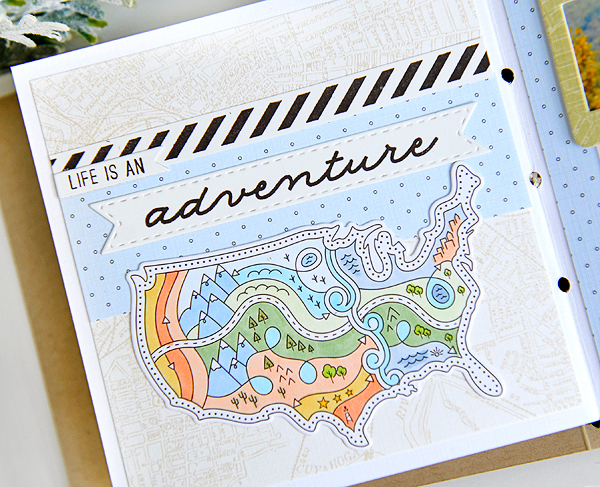 The first page uses the map from Betsy's new What The Doodle: Map stamp set. The second page, I did some hand journaling and framed a picture of my son with one of the frames from Monthly Moments: Mini Slide Frame. I colored the US map with Copic markers and cut it out with the matching die. I used the banner from Tag Sale Quilted to stamp adventure on. I also used paper from the Traveler's Journal paper pack for my background. 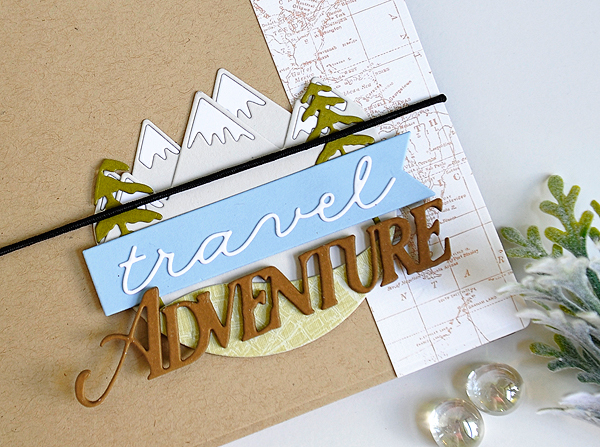 The black striped piece is a stamp included in the Traveler's Journal Adventure stamp set. I stamped it and just cut it out by hand and glued it down. 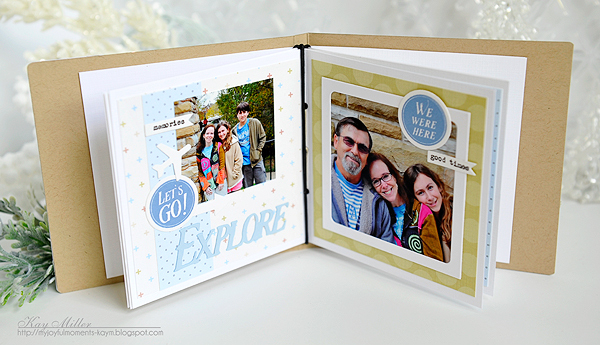 I used two more of the striped strips as a border for my journaling, than glued the photo of my son on top. I also added the arrow die and tiny banner with text. Here is an over all view of how the album looks from the inside. Heather will have a video on how to put it all together, but I'll let you know it was pretty easy. I was a bit overwhelmed when I saw all the pieces, wondering what in the world I was to do with each thing, but it was super simple once Heather explained things. And one last photo of the whole album closed up with the elastic cord. Isn't that cute! I can see doing one of these for Christmas kind of like a Daily December album! So fun! Here is a card I made to show you how you can incorporate these new products into your card making and paper crafts. I used the Cover Plate: Blue Skies and Cover Plate: Blue Skies Rays for my background. 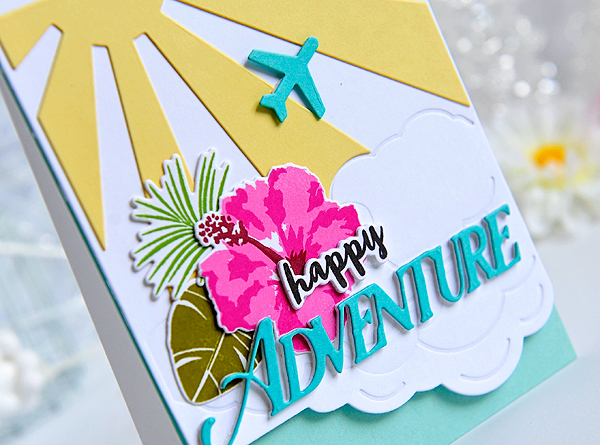 I used some of the beautiful new flowers and greenery from Some Like it Hot and Tropics, then added the Adventure die and the tiny plane from the new Traveler's Journal dies. 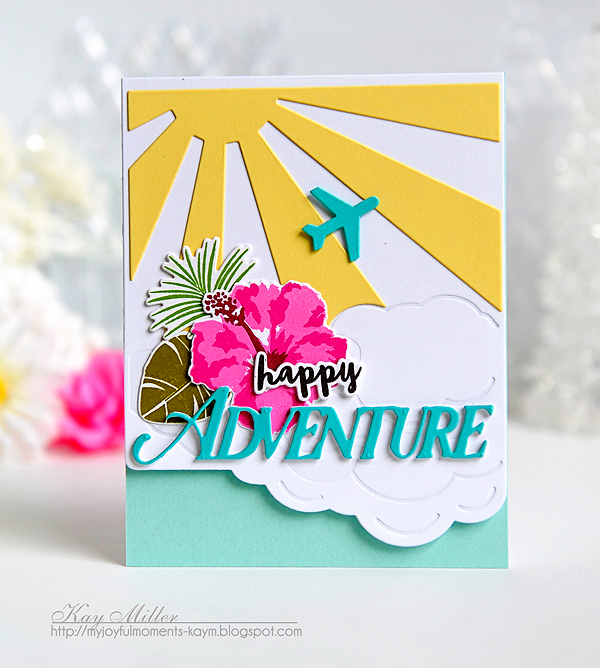 The happy sentiment is from the Tropics set, and I layered it three times before gluing it to the flower. Now I am off to stop by all of the other designer's blogs to see what they've done with all of this! Thanks so much for stopping by! 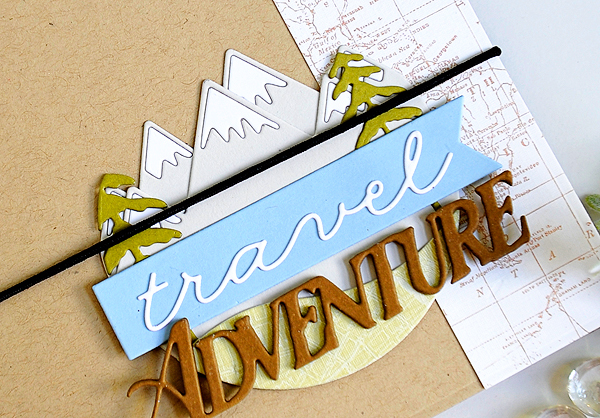 I'll be back tomorrow with a look at more of the amazing new products coming to Papertrey Ink on July 15th, at 10:00 EST! For more amazing inspiration visit the rest of the Papertrey Ink Design team! That photo book is just precious, what an amazing idea and I just LOVE how you did the cover! Fantastic work, Kay! You do equally well with paper scrapping, let me tell you! That little album looks like a lot of fun. I adore how you colored that map page. That is an awesome image. :) Your family is lovely and I always enjoying seeing pictures of them...and YOU! :) The card is terrific as well. It's good to see you can indeed use the elements for cardmaking as well. A fun card for any recipient. Thanks so much for sharing, Kay. Cannot wait to see what you share next. :) Hugs!! What a lovely way to spend a couple of afternoons remembering... gorgeous memory book. Love your detailing! Absolute perfection, (as always!). Just sighing, thinking of my own pictures, yet to be in an album! 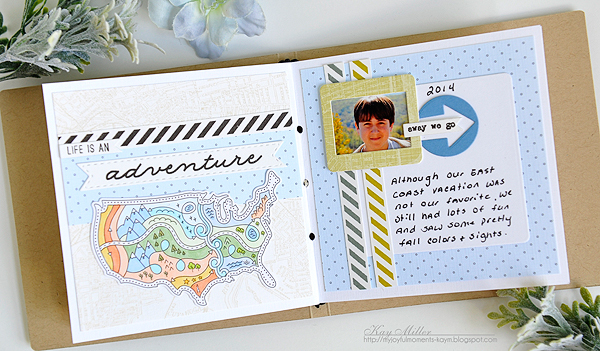 Beautiful travel journal, Kay! I love the color combo, and your card is absolutely gorgeous! I love how you play with stamps and dies from different sets to create such unique designs...you are amazing! 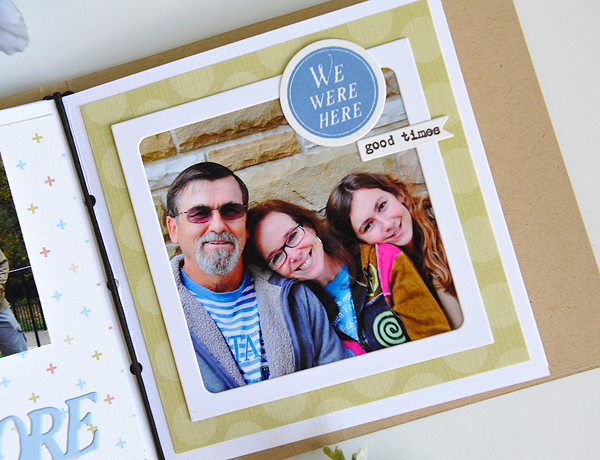 You have such a beautiful family, Kay...Thanks for sharing your photos with us! Love your book Kay - how clever to use the Scene it mountain die on the cover! 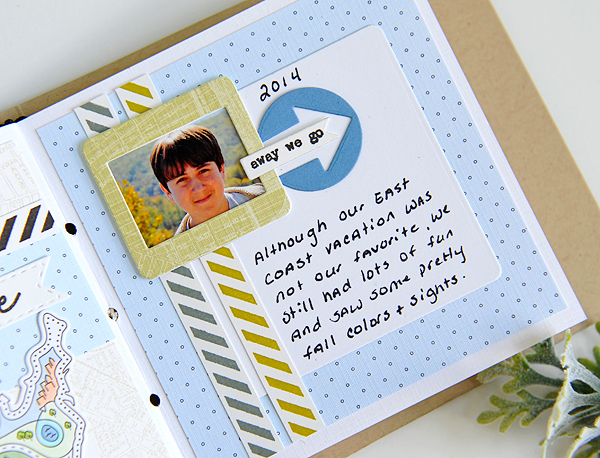 Your travel journal is stunning! I love your colors you used along with all the details! What a fun little book of memories! I am in awe of your travel journal. I LOVE the clean pages and the colors you used. Your cover rocks too. I am also in love with your card too. You amaze me. I love your little scrapbook Kay, the cover is just perfect!! Pretty card today too!! 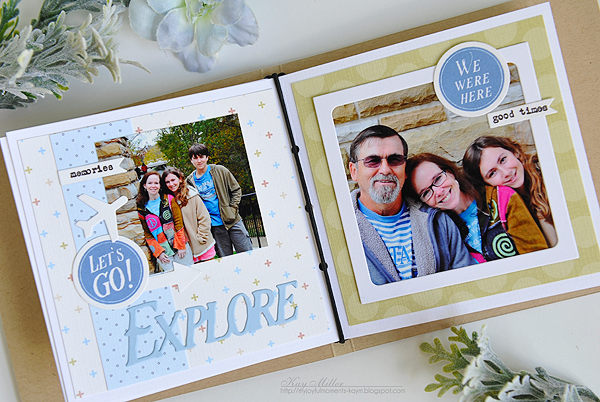 Love your little travel journal and seeing your beautiful family, Kay! The Scene It Mountains look fabulous on your album cover. Lovely and colorful card also! 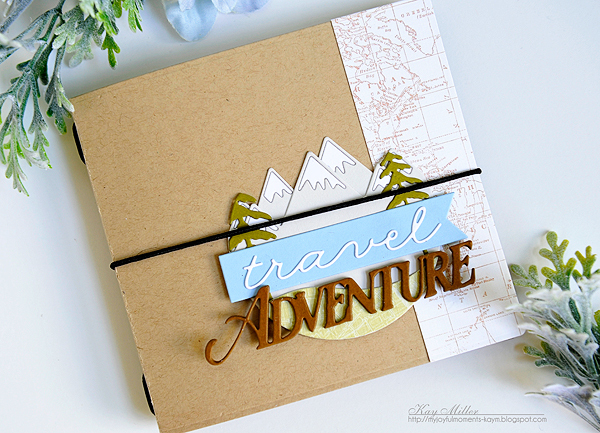 Gorgeous journal and beautiful card!